If you have ever paddled with UAC you know our beloved Uncle Ron. UAC wants you to know that he is going to be taking a sabbatical (indefinitely) from UAC river activities. This wasn’t an easy decision for Uncle Ron, it’s taken a few years. Uncle Ron loves UAC (he has the tattoo) and we love him! We are going to miss his smile, laughter, love for our paddlers and Mother Kaw. His timely wisdom. His inspection on the equipment to keep it in tip top shape. I can not tell how many times he has said to me, “We’ve got to shine Puppy!”. He will be missed at the boat ramp waiting patiently for paddlers as they arrive at the end of the float. If you have ever paddled with us you may not know much he cared that our paddlers had the best time possible and how much he thought, rethought and thought again before, during and after a float about the paddlers and their safety. 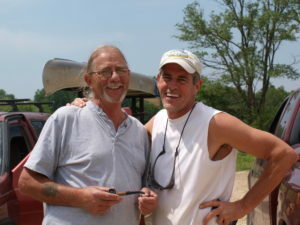 If you have ever wondered how easy it was to show up at the boat ramp, get on a bus, go to the location with gear ready, get in and paddle/float, have a wonderful time, get out at that the end and think I love kayaking, that’s Uncle Ron! It is in part due to Uncle Ron’s energy and effort to make it all happen seamlessly. Above all I am going to miss my friend as he is off to mark some items off his bucket list. I love him dearly and know that this is truly the best for him, his family and his life. UAC started over martinis and conversation on a cold winter night many years ago so its fitting that we all raise a toast to Uncle Ron! Cheers brother, safe travels, we love you and will miss you! Visit our Facebook page for more UAC Uncle Ron pictures.